I was in elementary school when John F Kennedy was killed. I remember being sent home early from school having no idea of the magnitude of what had just happened. Lee Oswald was charged with the crime, but before he could be brought to trial, he was shot and killed by Jack Ruby. Was Oswald alone responsible for the murder or was he working with someone else? And what would have happened if President Kennedy had been able to finish his term? What if you were given the opportunity to travel back in time to before Kennedy was killed. Knowing what we know today would you be able to stop Oswald? Would you even try? In Stephen King’s novel 11/22/63, Jake Epping, a high school English teacher is given just that opportunity. When Jake received a call from Al Templeton, the owner of a local diner, asking him to come to the diner as soon as possible, he put down the essays he was grading and went. Al did not sound like himself on the phone and Jake could not imagine why he was being summoned. Nor was he prepared for what he saw when he arrived at Al’s Diner. Al seemed to have aged years and it had only been 24 hours since he had last seen him. And then Al took him to the back of his pantry and showed him the door to the past…a time portal to 1958. I have always been fascinated with time travel and what is known as the Butterfly Effect, the theory that even a minor change in the past can drastically change the future. Jack Epping does walk through that portal and the repercussions are intriguing to say the least. A great deal of research went into writing this book and I actually learned quite a bit about the Kennedy assassination and the players involved. Stephen King is a wonderful story-teller and this was King at his best. There are no serial killers, no vampires, no dead animals and no evil forces from the other side in this book. 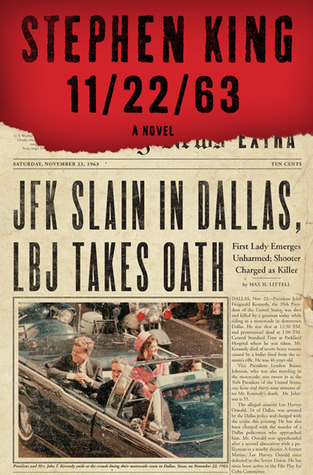 11/22/63 is a suspenseful, exciting read and even has a little romance thrown in. I was disappointed to read that plans for the movie adaptation have been dropped. Apparently the author and producer could not agree on which parts of this massive 800 plus page book should be included. Perhaps it is better suited for a mini series. Now that I would watch! A great review Susan! This book is going onto my “must read” pile! Thank you Jean. As you can see both Betty Jo and I agree………5 Omelets! I’m not a big Steven King fan but I really liked this book. I couldn’t put it down! It sounds incredible! I can’t believe it won’t be a movie!